Do you teach online? You need Connector. Connector adds effective classroom management to your online curriculum. With Connector’s real-time, to-the-point reporting and simple teacher/student communication, teachers can focus on teaching – easily keeping track of all their blended and distance-learning students. How will Connector help you? Every student has a progress bar showing at a glance whether he’s on pace to complete his courses on time: the bar is green for on-track or ahead, amber for behind, and red for far behind. It doesn’t get any easier. Which students are far behind? Who hasn’t logged in lately? Is Tina getting enough done? Do I need to grade any essays? Which students are earning Ds or Fs in their courses? Sort it out with a click and a glance using the class summary screens. Want to tell the whole school that assignments must be finished before the quarter ends on Friday? Want to congratulate Katherine for doing better in geometry? In Connector, you’re never more than 3 clicks from communicating with your students. Is the default pace too slow for a student? Is it too fast? Do you want to block schedule? 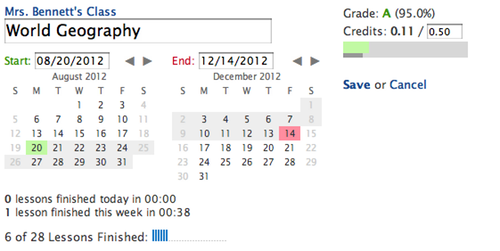 With just a few clicks, teachers can change course due dates for any student. All of Connector’s progress indicators will reflect the student’s personalized goals. Let parents check their students’ progress, watch student activity as it happens, apply custom grade weighting, export data for reporting, track daily usage times, reassign failed mastery tests with a click, track credits earned – keep students, parents, and teachers connected with their work! No sign up; no forms; no obligation. You can log into our demo server as an administrator, a teacher, or a student to get a feel for how Connector works. If you like what you see, why not see it with your own data? We'd be glad to set up Connector for you at no charge so you can try it out. Contact our sales team at Backbone Communications to get started. Call (800) 480-3935, ext. 103 or email josh@backbonecommunications.com.